Hi everyone! Ok, so I’m SUPER excited to post this week’s pattern. 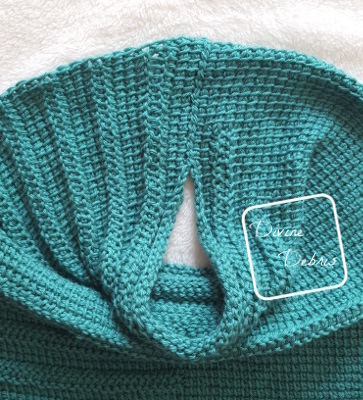 If you’ve been following me on IG I got a kit of Clover USA Tunisian crochet hooks and I set to work on figuring out what my first project would be with them. Now, this is my first time working with Tunisian so I opted to keep it rather simple, I didn’t want to bite off more than I can safely chew, ya know? I’ve had 5 skeins of Red Heart Soft in Sea Foam in my stash for years I think, I bought it for a pattern I was wanting to make and then that pattern never happened, as is with crafters all over the world, I imagine. 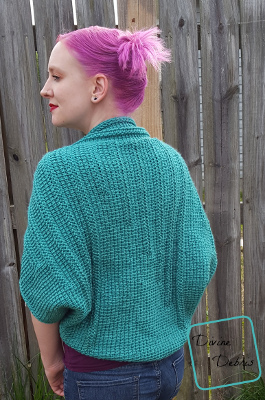 Luckily that that color and Tunisian were a great match and I was able to come up with this design… it’s also my first shrug/ top of any kind and I’m SO JAZZED. 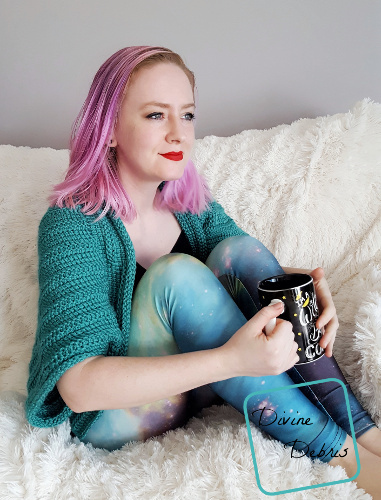 The response on IG and FB was so awesome, I would log in and see the comments and it would bring tears to my eyes – sometimes I feel like I don’t know what I’m doing and it’s so awesome to hear feedback like that. I really do read all the comments and take in what people say, both the good and the bad. Anyway… that’s not what I wanted to talk about today. 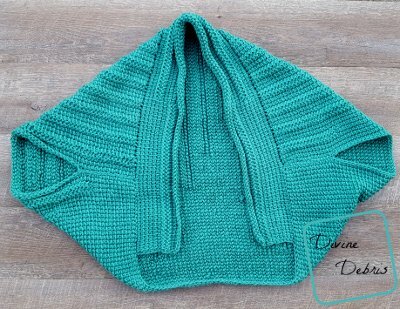 This shrug is so fun and so relaxing that I really hope you give it a try. 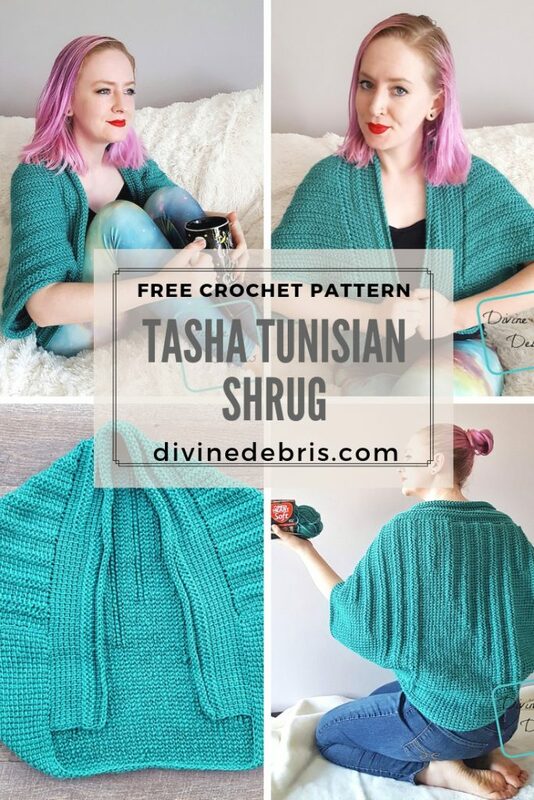 I found Tunisian to be really enjoyable, it’s got rhythm to it that traditional crochet doesn’t, almost memorizing in a way. Anyway I’ll write more on Tunisian another time. I wrote this pattern in 2 sizes because I’m still figuring my way around in this whole garment thing, maybe I’ll include larger sizes later. I really do hope you like this design and give it a chance! Also, this is my first Tunisian design… so if you have some feedback on how this pattern reads, please let me know! A huge thank you to Angela S. for becoming my newest patron on Patreon! This pattern is worked in 2 sections: the body of the shrug and the lapel. Both sections are worked in forward and backward passes. The rows are intentionally 1 extra st (81, 101 receptively). If you’re like me and just beginning in Tunisian, check out some amazing videos by Kim Guzman or on Moogly. There are really a ton of quality designers that are trying to help people learn, if you’re interested you should definitely check them out! The width measurement is from sleeve opening to sleeve opening. The height is measured from the bottom of the shrug to the where you attach the lapel. In the photos: the size worked is the small/ medium and made in Red Heart Soft in Sea Foam. Fold the “Body” piece in half and sew together the first 15 sts for Small/Medium & 20 sts for Large/XL (working towards the fold) on rows 1 and 93 or 138. This creates your arm holes on either side of the body piece. You can stop here if you’re happy or add the “Lapel” if you’d like it to look like the one in the photos. The photos below show folding the “Body” portion in half and seaming up the ends to create arm holes. Note: the lapel does not go all the way around the opening. 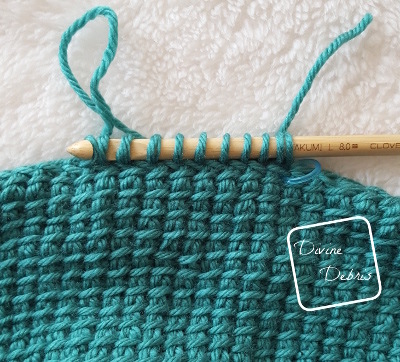 Place a stitch marker 20 sts for Small/Medium & 30 sts for Large/XL to the right of the seam you created by sewing the ends together (or to the left if you’re left handed). Then create a slipknot on your hook and starting in the st you placed your stitch marker pull up a loop in specified sts as the instructions below describe per the size you’re making. I worked the lapel across the side that the TPS are on so that the finished piece has a rain look to it, but you can do it along the other side if you would like the effect to be different, it won’t change the stitch counts for the “Lapel.” The photos below show the stitch marker and then pulling up loops on your hook. Hi! My only thought (to make it easier for YOU) is that most Tunisian patterns that I’ve seen only describe the return pass once, especially if there’s no change in how the RP is worked (Usually put in the notes section of the pattern). I think that would save you a bunch of time writing the pattern (and write MORE instead!!!). Just my two cents and I can’t wait to make this 🙂 Thank you! Very nice. 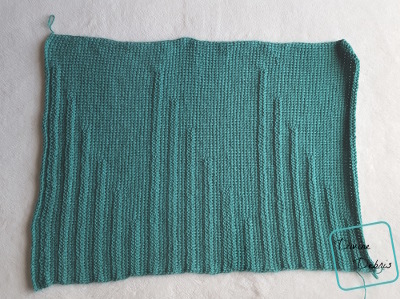 I had high hopes for Tunisian, but I have many of the same problems with it that I had with knitting. I guess I’m destined to be a crocheter at heart. I love all of the detail you have provided in your written instructions. This is my 1st Tunisian project. I have watched many instructional videos on YouTube. The only thing I would find helpful is with the photos. It would help me a lot if you had labels on the photos to describe what you are illustrating. For example, you state to “place a marker 20 sets for sm/med and 30 sets for lg/xlg to the RT of the seam….” I don’t know where to put the marker. I am a very visual learner. Just my thoughts. I love the pattern. Thank you. 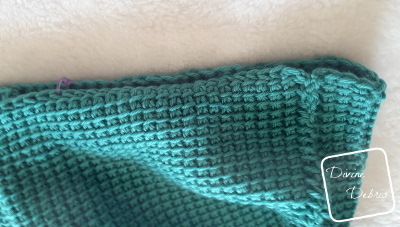 Hi, I have never tried Tunisian crochet yet, but have seen a few videos and am very keen to try it! 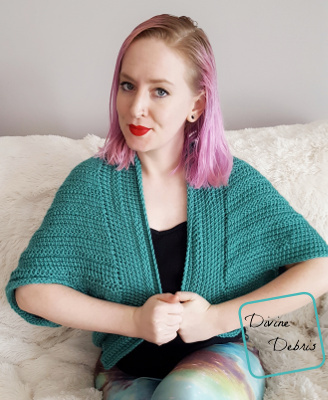 I love the look of this shrug!